If you'd like to make the most all-natural jam, jelly, marmalade or preserve that you possibly can, you'll be interested in how to make your own pectin. Pectin is a naturally occurring substance (a polysaccharide) found in berries, apples and other fruit. 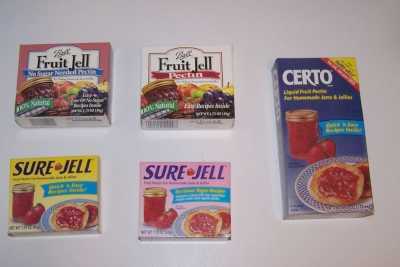 When heated together with sugar, it causes a thickening that is characteristic of jams and jellies. Your grandmother probably didn't use commercial pectin. Instead she stood over a hot, boiling pot, stirring and getting splattered by hot jam until she cooked the vitamins out of it and it finally cooked down to a thicker consistency. Or if she was very knowledgeable, she made her own pectin. She made it from apples and while doesn't change the flavor a bit, it helped her thicken the jam faster and allowed her to use less sugar! If you want to know more about pectin, what it is and how it works, see this page. Otherwise, continue below and we'll see how to make pectin at home.